M18BPD Combi Drill. M18BPD Combi Drill Features M18BPD Combi Drill Specification Flexible battery system: works with all Milwaukee® M18™ batteries. No load speed gear 1 (rpm): 0 - 450. No load speed gear 2 (rpm): 0 – 1800. 18 Volt Combi Drill. Consists of the M18FPD Combi Dril and the M18FID Impact Driver. Fuel Gauge Indicator. Quick and Easy Bit Change. 60% More Power. Flexible battery system: works with all Milwaukee® M18™ batteries. Impact rate (ipm): 0 - 2450/0 - 3450. 2 x M18B4 4.0Ah Batteries. Sound power level (dB(A)): 104.8. Sound power level uncertainty (dB(A)): 3. 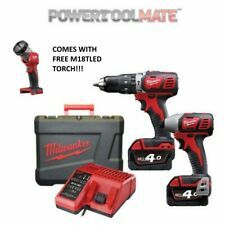 Milwaukee M18FPP2A-502X 18V Fuel Brushless Combi Drill and Impact Driver Kit with EXTRA FREE BATTERY. 1 x M18FPD Combi Drill. M18FPD Combi Drill Features M18FPD Combi Drill Specification Milwaukee® designed and built brushless POWERSTATE™ motor for up to 10x longer motor life and up to 60% more power. Milwaukee M18BMT 18V Compact Multi-Tool 18V with 4.0ah battery. also included is 3 x batteries 1 x 4.0ah and 2 x 5.0ah. need help just ask, i will do my best to help where i can. even if you are un-sure. Flexible battery system: works with all Milwaukee® M18™ batteries. No Load Speed: 0-450/0-1,800/min. No Load Speed: 0-2,000/0-2,750/min. Impact Rate: 0-28,800/bpm. Impact Rate: 0-2,450/0-3,450/bpm. M12BPD Sub Compact Combi Drill Flexible battery system: works with all Milwaukee M12™ batteries. No Load Speed - 0-400/0-1,500/min. 1/4" Hex chuck for quick and easy bit change. On board fuel gauge and LED light - added user convenience and illumination in low lit working conditions. 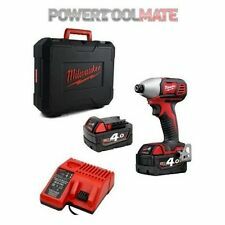 The item you are currently viewing is the Milwaukee M18FPP4N-524B 18V Fuel 4 Piece Kit with Combi, Impact Driver & Grinder. M18FPD Combi Drill Features 1 x M18CAG115XPDB Angle Grinder. M18CAG115XPDB Angle Grinder Features. Flexible battery system: works with all Milwaukee® M18™ batteries. No load speed gear 1 (rpm): 0 - 450. No load speed gear 2 (rpm): 0 - 1800. Impact rate (ipm): 0 - 2450 / 0 - 3450. No load speed (rpm): 0 - 2000 / 0 - 2750. Milwaukee® designed and built brushless POWERSTATE™ motor for up to 3x longer motor life and up to 20% more power. Works with all Milwaukee® M18™ batteries. Impact rate (ipm): 1800/2900/3700/0-3700. On board fuel gauge and LED light. WE WILL WORK TO RESOLVE ANY ISSUES YOU HAVE. CONDITION: NEW. 2720-20 sawzall reciprocating saw. 2- 5Ah battery. 2853-20 1/4" hex impact driver. The kit is in new condition without box. The kit includes Milwuakee kit bag/case. Connect via Bluetooth using the Milwaukee ONE-KEY app to program custom torque and speed settings and fine tune your tool. percussion rate (bpm) - 0 - 32,000. M18ONEPD Combi Drill Features Fuel gauge indicator. Shorter and is Up To 2X Faster Under Heavy Load. At 1,200 in-lbs of torque and 6.9" in length it has the power for demanding applications and allows access into tight spaces. Also includes is the M18 FUEL 1/4" Hex Impact Driver (2853-20) which is the Fastest, Most Compact, and Most Powerful tool in its class. 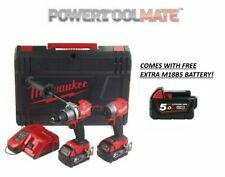 The item you are currently viewing is the Milwaukee M12PP2A-402C 12V Fuel Combi Drill & Impact Driver with Torch & Batteries. M12CPD Fuel Combi Drill. M12CPD Combi Drill Features M12CPD Combi Drill Specification. Hex Impact Driver for maximum performance on your toughest drilling and driving projects. of fastening torque. Included: one 2706-20 1/2 in. WHEN USED INTERNATIONALLY, USE THE APPROPRIATE CONVERTER. The 2497-22 M12 Cordless 2-Tool Combo Kit includes the M12 3/8 in. Hex Impact Driver (2450-20). M12 cordless 3/8 in. of torque and 0-400/0-1500 RPM. Includes: 2411-20 M12 cordless lithium-ion 3/8 in. Condition is New OPENED TO VERIFY CONTENT. At only 180mm in length, this is one of the most compact tool in its class, allowing users to have more access in tight spaces. Side handle included. Bright LED workspace illumination. The M18BLID2-0 Impact driver provides fast driving speeds and maximum power in a compact design. M18FPD Combi Drill Features M18FPD Combi Drill Specification Milwaukee® designed and built brushless POWERSTATE™ motor for up to 3x longer motor life and up to 20% more power. Flexible battery system: works with all Milwaukee® M18™ batteries. Includes: (1) M12 3/8 in. drill/driver (2407-20) and (1) belt clip. The powerful M12TM cordless lithium-ion 3/8 in. of torque-up to 25% more torque than the competition-and 0-400/0-1,500 RPM. The on board LED light and FUEL gauge help you increase productivity and avoid interruptions. M12CDP Fuel Combi Drill. 2x 12v 4.0Ah Batteries. M12CID Fuel Compact Impact Driver. Includes: 2407-20 M12 3/8 in. drill/driver, 2462-20 M12 1/4 in. The Milwaukee M12 12-Volt Lithium-Ion Cordless Drill Driver/Impact Driver Combo Kit (2-Tool) has the power and torque needed for professional and DIY applications in a compact size that reaches the tightest of spaces. The MILWAUKEE M18 Cordless Lithium-Ion 2-Tool Combo Kit includes the M18 Compact Drill/Driver (2606-20) and M18 1/4 in. Hex Impact Driver (2656-20). The kit includes one M18 Compact Drill/Driver (2606-20), one M18 1/4 in. At only 6.6 and 2.8 lbs. of torque. At 3,300 RPM the impact drives screws over 20% faster than competitors. At 5.1 in. L it allows for unmatched access in tight spaces. Mode 4 is Self-Tapping Screw Mode which is designed to reduce walking when starting self-tapping screws as well as reduce overdriving, breaking and stripping out screws. Milwaukee M18. Impact Driver. 2 tool Kit. 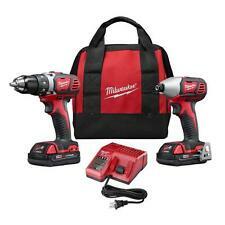 NEW Milwaukee 2996-22 18V Li-Ion Brushless Hammer Drill/Impact Driver Combo Kit. Condition is New. Comes as pictured, outer cardboard packaging is missing. See pics. Shipped with USPS Priority Mail. The MILWAUKEE M12 2-Tool Combo Kit includes the M12 3/8" Drill/Driver (2407-20) and the M12 1/4" Hex Impact Driver (2462-20). The impact driver's high-performance motor gives users 0-2,500 RPM for increased fastening speed. Condition is New. NEVER BEEN OPENED. The Milwaukee M18 ONEID ONE-KEY™ 1/4in Hex Impact Driver connects via Bluetooth™ with the Milwaukee® ONE-KEY™ app. Allows for complete tool customisation, allowing you to tune the tool to your needs. The Milwaukee Electric 2595-22 M12 FUEL 2PC Auto Kit optimizes torque in tight spaces. The POWERSTATE Brushless Motor outperforms all leading competitors with constant power output, yet runs cooler with no wearable components. The M18ONEPP2A One Key Kit consist of the following tools shown with the specifications Specification M18ONEPD Smart Combi Drill Specification M18ONEID Smart Impact Driver One Key Enabled: Yes.